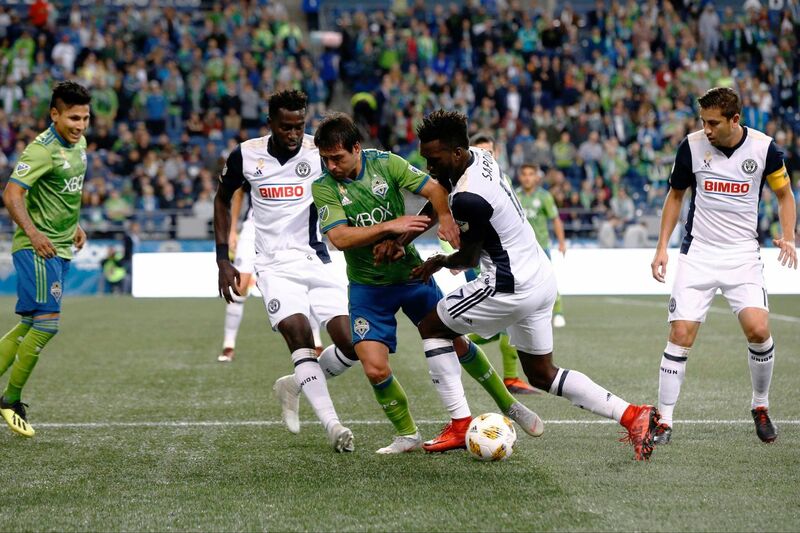 Derrick Jones (left) played a huge game for the Philadelphia Union in their 1-0 win at the Seattle Sounders. Union fans who checked their phones soon after waking up Thursday morning must have thought they were still dreaming. A 1-0 win at the Seattle Sounders on a Wednesday night? With a 93rd-minute goal by Fafa Picault while down a man? And helped by Jay Simpson, the long-maligned English striker whose two-minute cameo Wednesday night was his first appearance since April 13? Yes, it all really happened. Picault scored at about 1 a.m. Philadelphia time, giving Jim Curtin one of the most stunning wins in his five seasons as manager. And it instantly banished the bad karma from Saturday's face-plant at home against Montreal. "We talked a lot about the character of our team is going to be shown in how we respond after a difficult and disappointing performance against Montreal," Curtin told reporters in Seattle. "I thought that the players deserve a lot of credit for stepping up. It looked more like us." The Sounders held a 16-8 advantage in shots and 64.9 percent of the possession, and attempted 572 passes to the Union's 312. But just four of Seattle's shots were registered as on target. In fact, the Union ended up with more shots on goal (five) in the game. Would it be fair to say the Union didn't deserve the win? No. They did deserve it, and the list of reasons why starts with Derrick Jones. The 21-year-old, southwest Philadelphia-bred midfielder made just his second start of the year, as Curtin gave Borek Dockal the night off. It was a big spotlight, and Jones stepped up. He registered six interceptions, five clearances and three tackles, and his 41 passes at 78.1 percent accuracy led the team in both categories. Right back Keegan Rosenberry recorded four interceptions, three tackles, two clearances and a block. Center back Auston Trusty had five clearances, four interceptions and one block. Left back Ray Gaddis, who had a few rough moments in recent games, had five tackles and an interception before being subbed off in the 58th minute because of an ankle injury. His replacement, Fabinho, chipped in with an interception. "I thought the defending as a team — we raised our level," Curtin said. "And you're rewarded when you defend collectively as a team and we were rewarded with a goal, as late as it was." It was worth the wait, to say the least.